Nupur’s A-Z Indian Vegetables is a fun series. It is interesting to find out what exciting entries bloggers come up with, for each letter, every Sunday. As much as I would like to participate every week, it is just not possible, at least for me. But this week’s challenge got me thinking. I kept wondering about entries starting with ‘U’, that I was compelled to take part. It is a challenging letter, and I had few entries in mind. Urad vada – so predictable, Upma – I have already submitted Quinoa Upma, Ulli – already taken. In the hope of finding a suitable recipe, I was browsing through Samaithu Paar. And, I found Uppadam. This is a very old recipe, old that I only remember my grandma make this once, not even my mom. My grandma would make this because it keeps well for 2 days without refrigeration. 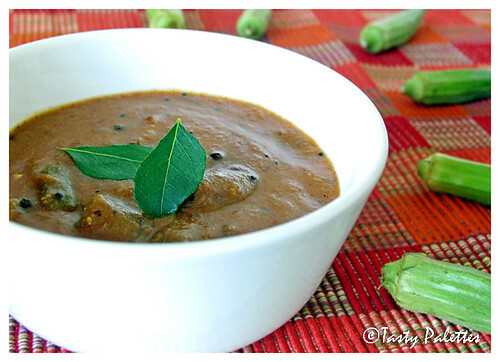 The addition of manathakkali vatral (Sunberry or Black Nightshade) gives this dish a subtle bitterness, compensating the tang from tamarind. The recipe is similar to vatral kuzhambu but not the same. 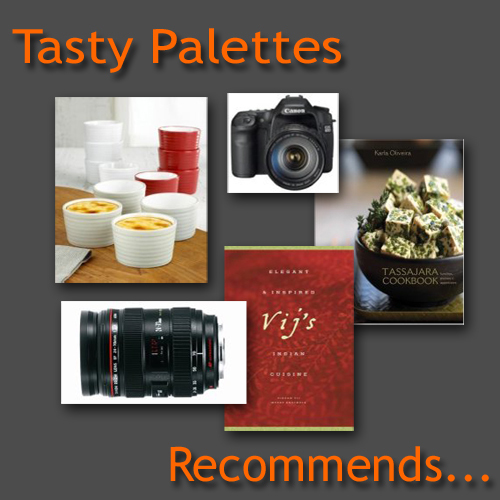 Its creamy, tangy and delicious. I know this is going to be a regular in my house. Vatral is anything that is sun-dried and hence can be stored year round. You can substitute any other sun-dried berries like sundakkai (Turkey Berry) or vegetables per your taste. Omit ladies finger for a longer shelf-life. And, don’t be alarmed by the number of chillies in the recipe, the rice flour will compensate the heat. In a dry skillet, roast rice, red chillies, ½ tsp of fenugreek seeds, each separately. The rice should release its aroma, fenugreek seeds and red chillies should turn dark brown. Allow them to cool and grind them to a fine powder. Transfer this to a bowl and mix it with 2 cups of water making sure there are no lumps. Set aside. In the same skillet, heat a tsp of oil. Splutter mustard seeds. Add fenugreek seeds, ladies finger and green chillies and manathakkali vatral in the same order. After the ladies finger turns bright green, add tamarind paste, 1 cup of water and salt. Boil till tamarind doesn’t smell raw anymore. Now add the prepared rice paste to the skillet. Boil for 10 minutes on low flame, while the sauce thickens. Serve with plain rice. Uppadam ...This is the first time I am hearing that name. Very different preparation....No need to say... Very good photos!!!!!! Wow! How wonderful to resurrect such an old recipe! It looks fabulous, I can almost taste this medley of spicy-tangy-bitter flavors. Maybe I will try another store & try ur recipe, looks very delicious!!! 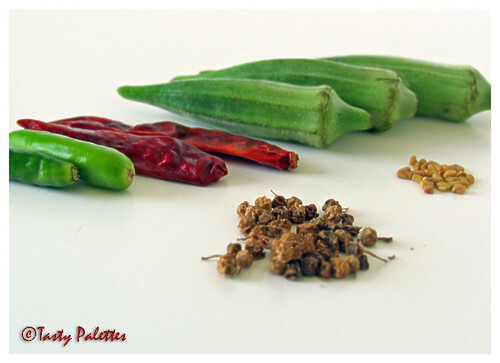 Gr8 recipe.. love okra in any form.. Awesome pic, the first one, but what is sunberry ? As always awesome presentation girl. By the way where can I find Manathakkali vatral. Is it available in the spice section? Your blog is excellent. I had to tell you that I made your Quinoa Upma and Mango Kulfi. We loved it very much. Thanks for the recipes. Lovely one, Suganya. I was thinking of making simple kozhambu with Manthakkali vathral (becuase of my allergies, apparently it helps a lot! ), and you gave me a new and delicious option, thanks a ton :). Hi Suganya! never heard this type of recipe. But really looks great and wonderful. Thanks for sharing. This is surely a very new dish for me. Never heard about it before.I think I have tried sun berries before, but they were too bitter for me. I am going to try it sometime. Thank you to each one of you for taking time to drop by. The sunberries i have in hand are bought from India. But I have seen bigger Indian stores carrying them. You don't get them in regular stores. Musical, Manathakkali vathal are so good for you. They have a cooling effect on yr stomach. Saute them in sesame oil and mix with plain rice. Tastes very good. Hearing the name for the first time...Mathapadi enna solle? :)..Vazhakkam pole pictures dhool.Sandwiches too.. I can't offer any valuable comments on the dish itself except to say that it looks tasty but what I can say is that your photographs are, clear, crisp and beautiful. Great job. WOW.......new recipe for lady finger......I definitely try your recipe. I copy your recipe. Black Nightshade! Wow! I always thought this was toxic until I looked it up and apparently, if eaten in small quantities, the fully ripe berries are edible. So where does one get hold of these different types of vatral? Are they available in the Indian grocery stores? My neighbour is a Tamil Brahmin and she used to make vatral kolambu,I have seen her make only with shallots,only through blogs I have heard about manathakali and vatral.Have to try these new ingredients. Also I read about Meenakshi Ammal and was amazed!Should look out for her cookery books in India.I have only heard of a programme on SunTV called Samaithu par,at first I thought you were referring to that. Ayoh!I forgot,I came here to tell you that I made your mango kulfi and it was yummilicious:)Thanks Suganya! Manisha, Black nightshade is available in Indian grocery stores. This is a new one for me, but if it has okra, it has to be good!!!! As always, ur pohotgraphs are awesome!!! that is truly unique. i've never heard of this recipe, nor has j. worth trying out. The name uppadam is new to me. I make vatral kuzhambu with manathakkali vatral.. ur recipe also sounds close to vatral kuzhambu and with ladys finger it looks good. Naaaaku oooruthu !!!!! Thanks for sending the link. Saw it just now.. will update to the site !